So, I am a SLOW colorer. Yeah, it’s not a word. It should be. Colorist? Maybe that’s better. I don’t care. Anyway. I need to learn to color faster, so I made myself go lickety split on this card. I colored 4 of that image in 15 minutes. It shows. Okay, I know it. but it doesn’t look HORRIBLE which is saying a lot. It doesn’t look good, but if I keep making myself do it, maybe I’ll get faster. 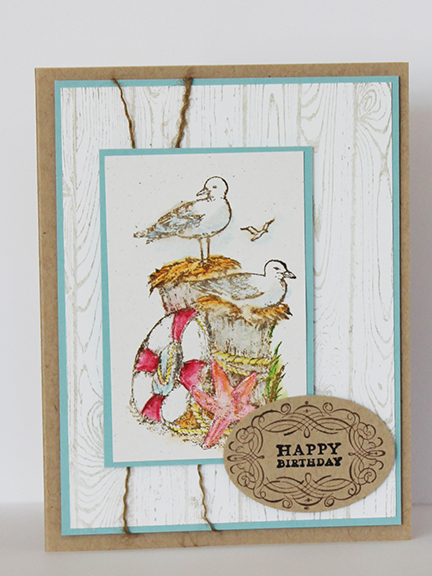 I know that Victorian-ish scroll work on the tag isn’t “beachy” but I kind of liked the eclectivity of the two together. It looked like a natural way that our possessions reflect different styles and meld together nicely. Or that’s my story and I’m sticking to it. Paper: SU Kraft & Baja. Neenah Solar. Techniques: Watercolor pencils and Aqua brush. Also watercolor crayons. So I saw this card on Pinterest. Now I can’t find it. I want to give the original designer credit, but I can’t. No idea what’s wrong and what search terms I used. I thought I “pinned” it so I could find it again, but shocker of all shockers–not there. I’m pretty sure the original didn’t use lace and did use another butterfly. That’s all I know. If you know whose it is, I’d love to give credit. If it was yours, please forgive me. I did try. UPDATE: Thanks to Nancy on Splitcoast Stampers, I found it. She called the paper scraps, “Washi” and I thought, “HEY! I bet I did find it under a washi search. And I did. WOOT! Paper: PTI White, scraps from MME and SU. Oh, Amuse gingham. LOVE that stuff. SU Rose red too-I think. Talk about a run-on sentence. Yes, I are a writer. 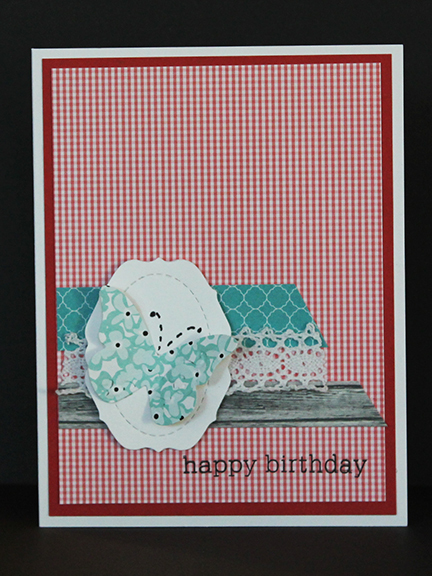 Ink: Unity Pallette Accessories: Lace trim from HL. 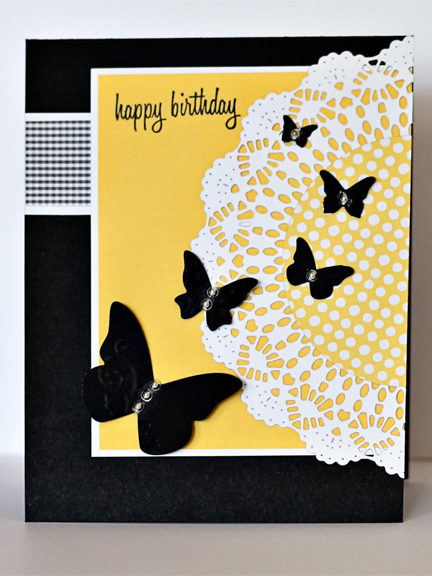 SU Dies–Beautiful Wings and some label thing I’ve never used before. Score for finally doing that. 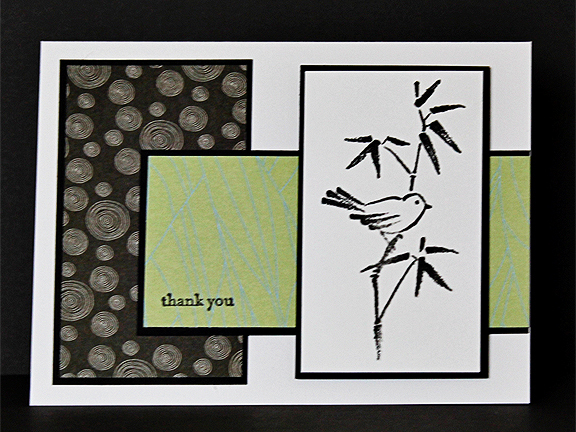 Had to make a few thank you cards a few weeks ago. Then I forgot to upload them here. OOPS. The photo doesn’t do this card justice. I’m just too lazy to take the stupid picture for a fourth time. Between memory card issues, (several times running) and other nonsense, I just didn’t feel like messing with it again. So, just trust me. It’s crisp, clean,and nice looking… even if the photo is a bit muddy. UGH. Stamps: SU Teeny tiny wishes and something Asian. Okay how on earth does a black and yellow card not end up looking like a squashed bumblebee? I love everything about this card. Had too much fun making it. It’s bright, cheerful, and still has a bit of elegance. Techniques: Die cutting??? Slapping paper on paper until it looks cool? Something like that.